The importance of post processing. Listen up, this is important. I apologize in advance if this turns into a ranting article of old. The plan is to stress the importance of post processing photographs as a vital part of the complete process of producing the image. The reason being that an image straight out of the camera is never really suitable for publication unless it is in the confines of a law enforcement document with such requirements. When a photographer is shooting in Raw there is no image until one of processed out of the data, I will explain further later in this post. The most common method of shooting is using the Jpeg format, which can work in some situations. I use it when I need to do non-critical high volume shooting, like at a foot race or other such event. Please note that this writing is not really intending to be an instruction article on how to post-process, rather just the importance of doing so. I am including a little bit on the how, but mostly there is a lot of content including some highly technical sciency reasons behind this necessity that I get into. So, what is post processing? We will be working with my personal definition; Post processing is any modification on an image after the exposure has been completed. This definition is logically sound, as modern cameras are capable of performing their own processing functions on Jpeg copies of the images in their memory cards. Lightroom, Photoshop, GIMP, MS Paint, Advanced Camera Raw, UFO Raw editor, Dark Table, and other various software are all post processing editors. The process can include adjusting the image back to reality, creating hyper realistic images, a slew of manipulations, and some abusive uses. Double exposures made in camera will be excluded from the definition, as they are grandfathered in from the film days. As a photographer you have two options; presenting the best images possible, or stuffing your foot in your mouth and delivering straight from your camera. The previous option sounds preferable, but it is amazing how many people are paid for photographic work yet deliver sub-standard images which may have had better potential. I have had discussions with clients and potential clients who have been dissatisfied with the work of previous photographers. Be it for the lack of their technical experience, creative sight, or simply failure to adjust the image. For myself, I shoot in Raw; there is no image until I assemble it. I also intentionally overexpose my images so that I can have the largest amount of data to work with in post. Below I will explain these statements. I recently meet with a potential commercial client who manufactures items for the home. They were horribly dissatisfied with their previous photographer. During the meeting I asked to see the images to determine exactly what made them so unhappy. The biggest problem was the adamant lack of post processing. The photographer claimed to be a “purist”, whom operate under a mantra of “my images come straight from the camera”. But in reality however you cut the cookie, you are manipulating your image, and if you shoot in Jpeg using a camera mode (landscape or portrait), or other settings you are actually manipulating more than your may have else wise. This article titled “Why being a purist in Photography is just nonsense” hits the nail on the head. Shooting photos in Raw is the professional’s choice method, now there are some out there who shoot in Jpeg alone. It is a personal preference, but so it cramming a fork into an electrical outlet. Raw is simply that, raw data. The camera sensor works by measuring the amount or value of light on a grey scale (black to white) under three colored filters, red, green, and blue. Each pixel is composed of a red, green, and blue filtered photoreceptor. The amounts of each color can later be combined to produce the image. Raw data is the individual measurements of the composition of the light for each pixel component. The image displayed on the back of the camera is an estimated Jpeg which could be produced from the data, the histogram is an estimate based on the estimated Jpeg. By no means can you gain more exact results by shooting in Jpeg, as it is rendered from the raw data before the camera permanently discards it. Now the raw data requires rendering which the camera can do automatically producing a Jpeg as I mentioned, or you can take it back home and work on it to get the exact results you wanted in the first place. The major advantage to using Raw is the capacity of data, it is all there. You can use tools such as Adobe Lightroom and Advanced Camera Raw which is a part of Photoshop, or UFO raw and Gimp to extract the data. There is a lot more data than what the preview screen can display, remember, estimates. The areas which appear pure white or black may contain useful data which can be extracted to show the detail in those areas. Developing the data is as necessary as it was when we all used film. The Raw file must contain the most usable information to produce the print. To the right, to the right, to the right…. Fig. 1a A value histogram. If you have read through digital photography guides then you may be familiar with terms such as “expose to the right”, “push to the right”, ect.. This is in reference to the histogram (Fig. 1a) which by definition is a data plot on an X and Y axis where X is a value lets say between 0 and 1024 and the Y values between 0 and 5000. Each pixel is plotted on this graph at a singular point based on its overall grey-scale value. So in essence on the right side of the graph indicates the number of brighter pixels, while the darker pixels are on the left. As you can see in figure 1a the data is primarily in the highlight, or brighter pixels on the right, but also significant data is on the left in the shadow regions. The divide in the data means that the image contains some contrast. Now, the bulk of usable data is on the right-hand side because as you get darker the camera can capture significantly less data each stop. When I mean significant I mean half, each stop you get darker in the image the camera can only capture half the data as the previous stop. As you attempt to render out the image it will produce more noise in the dark areas, so you really want to do what you can to avoid that. Pushing the image to the right by over exposing is a best practice. Even if the subject is dark you want that histogram to have the bulk of the data to the right. However you want to be careful. An overexposed image will produce a histogram similar to this. Note the spike on the far right hand side. additional information cannot be retained. The clipping in Fig. 1b indicates that the glass has overfilled and data has been lost, and is thus useless. Each number is a bit, the example is 4 bits long, a Jpeg is 8 bits per channel. Which provides a maximum total range of 0 to 255. So you have 255 levels of which each is a value of gray on the scale from complete black to fully white for each red, green, and blue component of a pixel. This may be easier to think of as a dimmer switch, which clicks through 255 positions and steps up the light output equally for each position until full output is achieved. Photoshop uses this 255 limit to represent the values in an image, as you can see in Fig. 1d. There is a light side, and a dark side to Photoshop, as with other editing software. I think of myself as being on the light side of the shop, where fashion photographers who manipulate and disfigure the human body are on the dark side. Where I find use, is bringing my data back to a more realistic image. A camera can only capture a portion of what our eyes see. For example taking a photograph of a room, where it is sunny outside. And while you can see the wonderful interior woodwork and look out the window and see the forests and hills your camera will not. Sadly it is one or the other, this is called dynamic range; or the range of values a camera can capture between black and white. There are ways to compile multiple images in post processing to achieve what you can see naturally. The easiest solution is to create an HDR, or High Dynamic Range image. Other methods employ layering the images on top of one another and masking in or out the sections you wish from each image to generate a composite. I consider this post processing as being an action to bring an image back to realism, and not a true manipulation. Some people will generate hyper-realistic images to better represent their vision, and the results can be amazing. Fig. 2a. Lens correction tabs in ACR. Post processing gives the photographer the ability to access and edit their image to produce the best photograph possible. So what do you do? Well, in all honesty whatever you would like to. Most of what needs to be done can be processed through Advanced Camera Raw (ACR) or Lightroom (LR). You will want to remove artifacts of the lens and to adjust the exposure where you would like it to be. Artifacts such as Chromatic Aberrations are green and or purple hues which form on the sharp edge of an object. Like a prism a lens can diffract light in a similar manner creating color casts. Typically checking the box as seen in Fig. 2a can correct these issues. You may need to manually correct the issue however. 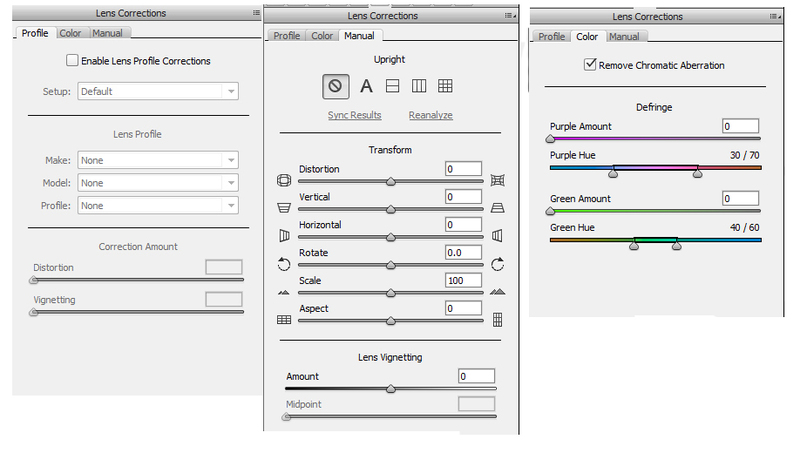 In lightroom you have a selection tool in the form of an eye dropper near the lens correction section. Click that and then sample some of the aberrations to make them magically go away. 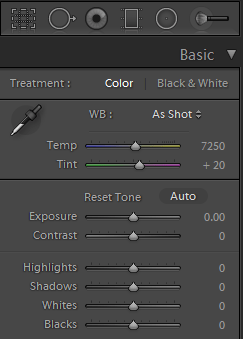 As with all these options in Advanced Camera Raw, they are available in Lightroom in the develop module. One of the most important thing is to get the exposure adjusted to the desirable levels. This is done on the basic screen of ACR or at the top on the right panel in LR. These sliders will look something like in Fig. 2b. At the top there are the adjustments for the white balance, you may be better off using the preset values for the shooting conditions (such as daylight, cloudy, or shady) you were working in, as you can spend hours learning the nuances of white balance. If you want to play with the slider a little bit, I encourage such behavior. It is very straight forward. 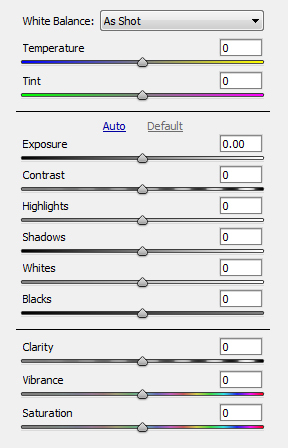 Move one of the sliders for temperature or int and the image will take a hue of the color you have slid towards. This can be used to add more of a warm color to the image, like you would find at sunrise or sunset. LR has a selection tool which can use to select a grey card if you photographed one to get the exact color temperature. There is also a product out there called a color checker passport, which will allow you to get a very exact temperature and color accuracy from the photograph. Working down the panel, exposure is the next adjustment; this will adjust the overall exposure of the image. Contrast will predictably add contrast. Highlights are the brighter parts of the image, the parts on the right hand side of the histogram. This is where you can get some of your detail back from an image which was exposed to the right. Back this slider down to the left a bit to reduce clipping and to being the more exposed section of the image back to reality. Shadows work the same but for the darker parts of the image. Take care when adjusting up the shadows however as they will produce more noise. Some detail can be rendered out but significantly less than which can come from the highlights. In Figure 2c you can see the lightroom equivalent, note the similarities. Photoshop has some adjustment tools as well, Fig. 1d is the levels adjustment. Moving the sliders around will clip the image so that you can render the full data in the image. 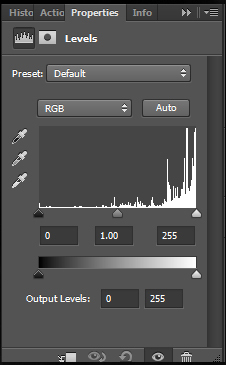 So if you have grey instead of black you can move the left slider to the right and clip all data to black on the left of the histogram. Holding ALT will allow you to preview how that is effecting the image. It will look weird, that’s alright. The colors it is showing are the ones which are being clipped to black in a particular area. It will do the same with the highlights. Where pure black or white are showing indicates a section has gone completely to those ends. This tool, is in photoshop as I mentioned. Which means that it is working with less available data then ACR or LR will work with, as they both are RAW editors. You use the RAW editors to pull out the best 8 or 16 bits of data, then edit that data in photoshop. That is how you can recover over and underexposed images better with these applications. Note that holding ALT will also work the same way in LR and ACR when adjusting the highlights, shadows, whites, and blacks. There is also a local adjustment tool, which is indicated by the brush looking tool on the right at the top of 2c. This is also found in ACR, in the tools panel. The brush tool will allow you to apply changes to the photo, much in the same way you do with the basic sliders; with the exception that these changes will only be made to the select areas you “paint” with the brush. Which if you have been playing around with them, which I hope you have. Then you would have noticed the profound effects they can have on the image. This tools creates that effect locally. Remember when painting with light to have a lot of feathering on it. There is also an option check box called “auto-mask”. This will activate a setting that will only apply the settings of the brush to similar parts of the image which the center of the circle is over when you are painting. This is useful when trying to paint a darker sky behind a portrait subject, or when lightening their faces up. The amount of splash will be greatly reduced if not negated completely. Pressing the backslash (\) key show the before image, and there is a check box which will revile the mask. Yes you are masking. Most of what you will need to do to render a more perfect image can be done in Lightroom or ACR, pushing the image to photoshop may be necessary depending on what the final outcome needs to be. Such as rendering HDR, advanced dodging or burning or actual manipulations of the image. By no means am I an expert in the nuances of Photoshop, I am quite new to it. There are better resources out there if you are needing to learn more about the program. I suggest Crative Live which frequently hosts experts and near experts you can learn from; also there are free online resources, printed books at your local bookshop or amazon, and most colleges will have courses on the topic. I hope that this article has stressed the points on why post processing is an important part of the artistic process. Remember that you want to strive for perfection, and always put your best work out there. Too many people have been selling, publishing, and providing clients with substandard work. Sadly this has led to a degradation of the art, and has devalued the work of professionals. Together we can save the art from this slippery downward slope.